On 13th and 14th of October Husse participated at the Quattrozampe Fair in Milano. 3 franchisees from the province of Milano participated at the event: Massimo Mandelli, Armando Chiantone and Matteo Musso. Husse Russia franchisees met with representatives from Husse Poland at the Euro Dog Show 2018. They liked very much Husse stand and they felt proud that they belong to HUSSE brand. Husse Russia participated in the exhibition, took the first places with dogs, and all these winning dogs eat only Husse food. 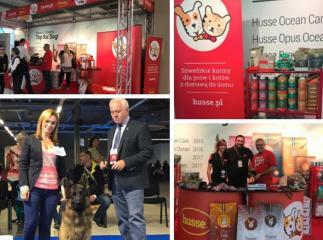 From 11th till 14th of October Husse participated in European Dog Show 2018 in Poland. Event took place in Warsaw Ptak Expo. This year, exhibitors presented 20,000 dogs from over 200 breeds. Husse stand looked very nice and attracted a lot of visitors.